Inferior vena cava filter - Gunther Tulip. An inferior vena cava filter is a type of vascular filter, a medical device that is implanted by interventional radiologists or vascular surgeons into the inferior vena cava to presumably prevent life-threatening pulmonary emboli (PEs). Their effectiveness and safety profile is not well established, and in general, they are only recommended in some high-risk scenarios. They are not intended to be a replacement for medical (drug-based) management of venous thromboembolism (VTE). However, in cases where patients are at high risk of developing a clinically significant PE and cannot be sufficiently anticoagulated, placement of an IVC filter may be recommended. To date, there has been only one randomized controlled trial completed on IVC filters. This study found that IVC filters reduced the incidence of PE but increased the incidence of deep vein thrombosis (DVT). All patients were on anticoagulation drugs during the study. Results from the PREPIC study and other studies which have shown many long-term complications of IVC filters led to the introduction of retrievable IVC filters. The first retrievable IVC filters were approved by FDA in 2003 and 2004. In 2012, the American College of Chest Physicians recommended IVC filters for those with contraindications to anticoagulation who either have acute PE or acute proximal (above the knee) deep vein thrombosis (DVT). The first IVC filter was created by Kazi Mobin-Uddin, MD who published his findings in 1969 in the New England Journal of Medicine. The Mobin-Uddin filter was later replaced by the Greenfield filter developed by Lazar Greenfield which had a lower rate of filter related complications. While the ability to retrieve a filter does exist for many models, it cannot be guaranteed that all cases of filter placement will allow for, or be indicated for retrieval. Thus, the requirements and indications for permanent placement of filters is used to decide on when to use both permanent and temporary IVC filters. These are patients that should strongly consider having IVC filter placement, as they are at greatest risk of pulmonary embolus. This is a maybe category; normally it represents patients who could benefit from an IVC filter, but may be just fine without one as well. These are usually very controversial reasons to do an IVC filter, and most radiologists and doctors generally will not recommend an IVC filter if other options are available instead. Bariatric patients: Undergoing surgery for weight control, only if BMI greater than 55, previous history of DVT/PE, hypercoagulable state, chronic venous insufficiency, truncal obesity or contraindication to anticoagulation therapy. In those with initial acute proximal DVT or acute PE who had IVC filters placed instead of anticoagulation, and who have their risk of bleeding resolve, the American College of Chest Physicians suggested, in 2012, that they receive a standard course of anticoagulation. While IVC filters are associated with a long term risk of DVT, they are not, alone, reason enough to maintain extended anticoagulation. The main function of a vena cava filter is to prevent death from massive pulmonary emboli. Long-term clinical follow-up studies have shown that this is accomplished in 96% of cases having a standard stainless-steel Greenfield filter. Abdominal radiograph shows that one of the legs (arrows) of the IVC filter is pointed away from the expected IVC lumen. Axial CT image confirms that one of the legs (arrow) of the IVC filter has migrated out of the IVC wall into an adjacent tissue. In August, 2010, the FDA released an Initial Communication on the Risk and Adverse events associated with Long Term use of an inferior vena cava filter. Over a period of about 5 years, they identify 921 events. While not the majority of cases, that number still represents a statistical significance of the use of long-term IVCs. Of these IVC filter side effects, 328 involved device migration, 146 involved embolizations after detachment of device components, 70 involved perforation of the IVC, and 56 involved filter fracture. Much of the medical community believes that this large number of adverse events is related to the heart filter remaining in place for longer than necessary. While these side effects are not common (less than 10-20% of patients), many do report issues stemming from the placement and complication of the IVC while inside of the body. Filter fracture: Broken struts migrate to retroperitoneum, requiring exploration. Also struts can migrate to the heart and can cause pericardial effusion and tamponade. Perforation into the duodenum: Resulting in severe diarrhea and weight loss. Arterial hemorrhage: Requires surgery to avoid death. Misplaced Filter: Causes pericardiac tamponade requiring surgery under cardiopulmonary bypass. Filter Migration to Right Atrium: Resulting in acute myocardial infarction. Filter Lodged in Heart: Causes life-threatening arrhythmia and often requires pacemakers to resolve condition. Heart Migration: Requires surgery to remove IVC from heart. Sudden Death: Caused by the filter migrating to an active region in the heart. Migration of Filter to Chest: Requires surgery. Perforation of filter strut into small-bowel: Requires surgery to repair perforation. Even though the cases above are the exception, and not the rule, most radiologists object to doing prophylactic filter insertions in patients who do not have thromboembolic diseases. For the most part, whenever possible, interventional radiologists would rather start the patient on anticoagulants than use an IVC, even if requested or referred via a doctor. While most IVC filters are made of non-ferromagnetic materials, there are a few types that are weakly ferromagnetic. Accordingly, IVC filters fall under the MRI Safe and MRI Conditional categories depending mostly on type of material used during construction. Rarely will one find an MRI Not Safe IVC filter, as most of the steel, and other ferromagnetic material devices have been discontinued via the FDA. IVC filters are attached to the vena cava via hooks on their ends. Some are compression springs, which compress outward onto the side wall of the vena cava; however, they still have small hooks that retain their location. These hooks aid in the anchoring and healing process, as they allow the tissues to 'ingrow' around them, securing the IVC in place. It is unlikely, then, after 4 to 6 weeks of healing, that an MRI of 1.5 tesla, up to 3 tesla, will cause any level of dislodging to occur to the IVC filter. Studies of MR examination of both animals and humans, with implanted IVC filters, have not reported complications or symptomatic filter displacement. Several animal studies have even used "real-time" MR for the placement of IVC filters to check for rotation, sheering, and other artifacts. As part of the 'routing' survey for MRI studies, patients who have IVC filters will often need verification from the doctor, or medical records, to state that the IVC is safe for the MRI. Most patients with weakly or non-safe ferromagnetic implants will be given a card, which they keep on their person at all time, that can help isolate if it is safe to do an MRI. For patients who have been denied MRI scans for safety reasons, doctors usually recommend the CT scan with contrast as an alternative. Most IVC filters that have been tested have been labeled as “MRi safe”; the remainder of IVC filters that have been tested are “MR conditional.” Patients who have been treated with nonferromagnetic IVC filters can undergo MR examination any time after filter implantation. In patients who have been treated with a weakly ferromagnetic IVC filter (Gianturco bird nest IVC filter [Cook], stainless steel Greenfield vena cava filter [Boston Scientific]), it is advised that the patient wait at least six weeks before undergoing an MR examination (because these older devices initially may not be anchored as firmly in place as other devices discussed in the present context), unless there is a strong clinical indication to perform the MR examination sooner after implantation, and as long as there is no reason to suspect that the device is not positioned properly or that it is not firmly in place. Most studies of IVC filters have generally been conducted at 1.5 tesla or less, although many IVC filters have now been evaluated at 3 tesla and deemed acceptable for MR examination. IVC filters are placed endovascularly, meaning that they are inserted via the blood vessels. 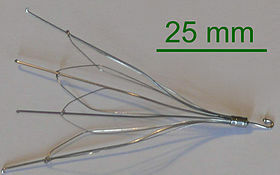 Historically, IVC filters were placed surgically, but with modern filters that can be compressed into much thinner catheters, access to the venous system can be obtained via the femoral vein (the large vein in the groin), the internal jugular vein (the large vein in the neck) or the arm veins with one design. Choice of route depends mainly on the number and location of any blood clot within the venous system. To place the filter, a catheter is guided into the IVC using fluoroscopic guidance, then the filter is pushed through the catheter and deployed into the desired location, usually just below the junction of the IVC and the lowest renal vein. Review of prior cross-sectional imaging or a venogram of the IVC is performed before deploying the filter to assess for potential anatomic variations, thrombi within the IVC, or areas of stenoses, as well as to estimate the diameter of the IVC. Rarely, ultrasound-guided placement is preferred in the setting of contrast allergy, renal insufficiency, and when patient immobility is desired. The size of the IVC may affect which filter is deployed, as some (such as the Birds Nest) are approved to accommodate larger cavae. There are situations where the filter is placed above the renal veins (e.g. pregnant patients or women of childbearing age, renal or gonadal vein thromboses, etc.). Also, if there is duplication of the IVC, the filter is placed above the confluence of the two IVCs  or a filter can be placed within each IVC. The concept of a removable IVC filter was first thought up in 1967. However, it was not until 2003 and 2004 that the United States Food and Drug Administration drafted regulations and requirements on creating devices that were fit for retrieval from the vena cava  And still, even while the FDA did approve of the models and designs, it wasn't until 2005 that the Society of Interventional Radiology (SIR) convened a multidisciplinary conference to address the clinical application of nonpermanent vena cava filters. Retrievable filters are fitted with a device (varying from model to model) that allows them to be easily snared and pulled back into a catheter and removed from the body, often through the jugular vein. Prior to 2004, filters that had been in the IVC for less than three weeks were considered suitable to attempt retrieval, as filters that have been in place longer might have been overgrown by cells from the IVC wall and there was an increased risk of IVC injury if the filter is dislodged. Newer designs, and developments in techniques mean that some filters can now be left in for prolonged periods and retrievals after a year are now being reported. This would include the ALN, Bard G2 and G2x, Option, Tulip and Celect filters. It is important to note that the clinical exam prior to the removal of the filter is vital in understanding both the risk and pathophysiological effects removing the filter will have on the patient. Doctors and medical professionals must consider several key factors (see Indications for removing IVC filters). ^ Gunther Tulip IVC Filter. Cook Medical. URL: http://www.cookmedical.com/di/di_front/images/dif_bu1.jpg. Accessed on: November 24, 2007. ^ a b c Kaufman, JA; Kinney TB; Streiff MB; et al. (March 2006). "Guidelines for the use of retrievable and convertible vena cava filters: report from the Society of Interventional Radiology multidisciplinary consensus conference". Journal of Vascular Interventional Radiology. 3. 17 (3): 449–459. doi:10.1097/01.rvi.0000203418-39769.0d. PMID 16567669. ^ PREPIC Study, Group (19 July 2005). "Eight-year follow-up of patients with permanent vena cava filters in the prevention of pulmonary embolism: the PREPIC (Prevention du Risque d'Embolie Pulmonaire par Interruption Cave) randomized study". Circulation. 112 (3): 416–22. doi:10.1161/circulationaha.104.512834. PMID 16009794. ^ Kaufman, JA; Kinney, TB; Streiff, MB; Sing, RF; Proctor, MC; Becker, D; Cipolle, M; Comerota, AJ; Millward, SF; Rogers, FB; Sacks, D; Venbrux, AC (2006). "Guidelines for the use of retrievable and convertible vena cava filters: report from the Society of Interventional Radiology multidisciplinary consensus conference". Surgery for Obesity and Related Diseases. 2 (2): 200–12. doi:10.1016/j.soard.2006.03.009. PMID 16925346. ^ Guyatt et al. 2012, p. 21S: 2.13.2. ^ Guyatt et al. 2012, p. 24S: 5.9.2. ^ Mobin-Uddin K, Callard GM, Bolooki H, Rubinson R, Michie D, Jude JR (1972). "Transvenous caval interruption with umbrella filter". New England Journal of Medicine. 286 (2): 55–8. doi:10.1056/NEJM197201132860202. PMID 5006878. ^ Cain, PG (1995). "Comment on "Treatment of venous disease — The innovators". Journal of Vascular Surgery. 22 (3): 341–2. doi:10.1016/s0741-5214(95)70156-7. ^ a b Galanaud JP, Laroche JP, Righini M (2013). "The history and historical treatments of deep vein thrombosis". Journal of Thrombosis and Haemostasis. 11 (3): 402–11. doi:10.1111/jth.12127. PMID 23297815. ^ Hussain, SA (1999). "Kazi Mobin-Uddin, 1930-1999". Journal of Vascular Surgery. 32 (2): 406–7. doi:10.1067/mva.2000.108645. PMID 10918004. ^ a b Kaufman, JA. "Guidelines for the use of retrievable vena cava filters". Touch Briefings. Retrieved 20 December 2010. ^ Baumann, DS. "IVC filter placement in bariatric patients". Endovsc Today. Retrieved 2012-10-11. ^ Guyatt et al. 2012, p. 21S: 2.13.3. ^ Guyatt et al. 2012, p. 24S: 5.9.3. ^ Greenfield, LJ; Peyton R; Crute S; Barnes R (1981). "Greenfield vena caval filter experience: late results in 156 patients". Archives of Surgery. 116 (11): 1451–1456. doi:10.1001/archsurg.1981.01380230065010. ^ Food and Drug Administration. "Inferior Vena Cava (IVC) Filters: initial Communication: Risk of Adverse Events with Long Term Usage". United States Food and Drug Administration. Retrieved 2015-03-15. ^ Ferris, EJ; McCowen TC; Carver DK; McFarland DR (1993). "Percutaneous inferior vena cava filters: follow-up of seven designs in 320 patients". Radiology. 188 (3): 851–856. doi:10.1148/radiology.188.3.8351361. PMID 8351361. ^ Taheri, SA; Kulaylat MN; Johnson E; Hoover E (1992). "A complication of the Greenfield filter: fracture and distal migration of two struts, a case report". Journal of Vascular Surgery. 16: 96–99. doi:10.1016/0741-5214(92)90424-7. ^ Kalavakunta, Jagadeesh K.; Thomas, Christopher S.; Gupta, Vishal (2009-11-01). "A needle through the heart: rare complication of inferior vena caval filters". The Journal of Invasive Cardiology. 21 (11): E221–223. ISSN 1557-2501. PMID 19901424. ^ Appleberg, M; Crozier JA (1991). "Duodenal penetration by a Greenfield caval filter". ANZ Journal of Surgery. 61 (12): 957–960. doi:10.1111/j.1445-2197.1991.tb00017.x. ^ Howerton, RM; Watkins M; Feldman L (1991). "Late arterial hemorrhage secondary to a Greenfield filter requiring operative intervention". Surgery. 109: 265–268. ^ Lahey, SJ; Meyer LP; Karchmer AW; et al. (1991). "Misplaced caval filter and subsequent pericardial tamponade". Annals of Thoracic Surgery. 51 (2): 299–300. doi:10.1016/0003-4975(91)90805-z. ^ Puram, B; Maley TJ; White NM; Rotman HH; Miller G (1990). "Acute myocardial infarction resulting from the migration of a Greenfield filter". Chest. 98 (6): 1510–1511. doi:10.1378/chest.98.6.1510. ^ Bach, JR; Zaneuski R; Lee H (1990). "Cardiac arrhythmias from a malpositioned Greenfield filter in a traumatic quadriplegic". American Journal of Physical Medicine & Rehabilitation. 69 (5): 251–253. doi:10.1097/00002060-199010000-00005. ^ Villard, J; Detry L; Clermont A; Pinet F (1987). "Eight cases of Greenfield filters in the right heart cavities: their surgical treatment". Annals of Radiology. 30: 102–104. ^ Poillaud, C; Paillard F; Biron Y; Gouffault J (1988). "Proximal migration of a caval filter: apropos of a case". Annales de Cardiology et d'Angéiologie. 37: 129–131. ^ LaPlante, JS; Contractor FM; Kiproff PM; Khoury MB (1993). "Migration of the Simon nitinol vena cava filter to the chest". American Journal of Roentgenology. 160 (2): 385–386. doi:10.2214/ajr.160.2.8424358. PMID 8424358. ^ Kupferschmid, JP; Dickson CS; Townsend RN; Diamond DL (1992). "Small-bowel obstruction from an extruded Greenfield filter strut: an unusual late complication". Journal of Vascular Surgery. 16: 113–115. doi:10.1016/0741-5214(92)90427-a. ^ Emerson, RH, Jr; Cross R; Head WC (1991). "Prophylactic and early therapeutic use of the Greenfield filter in hip and knee joint arthroplasty". Journal of Arthroplasty. 6 (2): 129–135. doi:10.1016/s0883-5403(11)80007-0. ^ Olin, JW; Young JR; Graor RA; Ruschhaupt WF; Beven EG; Bay JW (1987). "Treatment of deep-vein thrombosis and pulmonary emboli in patients with primary and metastatic brain tumors: anticoagulants or inferior vena cava filters?". Archives of Internal Medicine. 147 (12): 2177–2179. doi:10.1001/archinte.147.12.2177. ^ Watanabe AT, Teitelbaum GP, Gomes AS, Roehm JO Jr (1990). "MR imaging of the bird's nest filter". Radiology. 177 (2): 578–579. doi:10.1148/radiology.177.2.2217801. PMID 2217801. ^ Kiproff PM, Deeb ZL, Contractor FM, Khoury MB (1991). "Magnetic resonance characteristics of the LGM vena cava filter: technical note". Cardiovasc Intervent Radiol. 14 (4): 254–255. doi:10.1007/bf02578474. ^ Kim D, Edelman RR, Margolin CJ, Porter DH, McArdle CR, Schlam BW, Gianturco LE, Siegel JB, Simon M (1992). "The Simon nitinol filter: evaluation by MR and ultrasound". Angiology. 43 (7): 541–548. doi:10.1177/000331979204300701. PMID 1626731. ^ Grassi CJ, Matsumoto AH, Teitelbaum GP (1992). "Vena caval occlusion after Simon nitinol filter placement: identification with MR imaging in patients with malignancy". J Vasc Interv Radiol. 3 (3): 535–539. doi:10.1016/s1051-0443(92)72008-9. ^ Bartels LW, Bakker CJ, Viergever MA (2002). "Improved lumen visualization in metallic vascular implants by reducing RF artifacts". Magn Reson Med. 47 (1): 171–180. doi:10.1002/mrm.10004. PMID 11754456. ^ Liebman CE, Messersmith RN, Levin DN, Lu CT (1988). "MR imaging of inferior vena caval filters: safety and artifacts". American Journal of Roentgenology. 150 (5): 1174–1176. doi:10.2214/ajr.150.5.1174. PMID 3258722. ^ Bucker A, Neuerburg JM, Adam GB, Glowinski A, Schaeffter T, Rasche V, van Vaals JJ, Günther RW (2001). "Real-time MR guidance for inferior vena cava filter placement in an animal model". J Vasc Interv Radiol. 12 (6): 753–756. doi:10.1016/s1051-0443(07)61448-1. ^ Frahm C, Gehl HB, Lorch H, Zwaan M, Drobnitzky M, Laub GA, Weiss HD (1998). "MR-guided placement of a temporary vena cava filter: technique and feasibility". J Magn Reson Imaging. 8: 105–109. doi:10.1002/jmri.1880080121. ^ MRI safety. Institute for Magnetic Resonance Safety, Education, and Research Web site. Available at: http://www.MRIsafety.com. Accessed June 19, 2006. ^ Shellock FG. Reference Manual for Magnetic Resonance Safety, Implants, and Devices: 2006 Edition. Los Angeles, Calif: Biomedical Research Publishing Group; 2006. ^ Kinney, Thomas; Cameron, S; Sass, P; Zoller, M; Wigler, M (1 September 2006). "Inferior Vena Cava Filters". Seminars in Interventional Radiology. 23 (3): 230–239. doi:10.1055/s-2006-948760. PMC 3036373. PMID 21326769. ^ Mano, Tatsumi T; Sakai H; et al. (2004). "A case of deep venous thrombosis with a double inferior vena cava effectively treated by suprarenal filter implantation". Japanese Heart Journal. 45 (6): 1063–1069. doi:10.1536/jhj.45.1063. ^ Sartori, MT; Zampieri P; Andres AL; Prandoni P; Motta R; Miotto D (2006). "Double vena cava filter insertion in congenital duplicated inferior vena cava: a case report and literature review". Haematologica. 6. 91 (ECR30). ^ Williams R, Schenk W (1970). "A removable intracaval filter for prevention of pulmonary embolism: early experience with the use of the Eichelter catheter in patients". Surgery. 68 (6): 999–1008. PMID 5483252. ^ Kaufman J (2004). "Retrievable vena cava filters". Tech Vasc Interv Radiol. 7 (2): 96–104. doi:10.1053/j.tvir.2004.02.006. PMID 15252767. ^ McKenzie S, et al. "An Australian experience of retrievable inferior vena cava filters in patients with increased risk of thromboembolic disease". International Angiology. 29 (1): 53–57. Guyatt, GH; Akl, EA; Crowther, M; et al. (2012). "Executive Summary: antithrombotic therapy and prevention of thrombosis, 9th ed: American College of Chest Physicians evidence-based clinical practice guidelines" (PDF). Chest. 141 (suppl 2): 7S–47S. doi:10.1378/chest.1412S3. PMC 3278060. PMID 22315257. Archived from the original (PDF) on 2012-09-07. Athanasoulis, Christopher A, MD (1993). "Complications of Vena Cava Filters" (PDF). Journal of Radiology. 3. 188 (3): 614–615. doi:10.1148/radiology.188.3.8351319. PMID 8351319. Retrieved 2012-10-11. This page was last edited on 27 March 2019, at 20:30 (UTC).